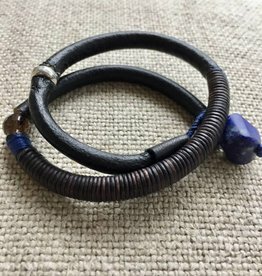 Leather bracelet with dinosaur bone, lapis lazuli and bone skull. Hand cut and polished agate set in oxidized sterling silver, with hinge detail and a 4mm rose cut black diamond. Hung from a hand fabricated oxidized sterling silver chain.